cultural heritage, with numerous old churches and other historical monuments, and much more. In a series of articles, we will describe our experiences during our stay on Bohol. 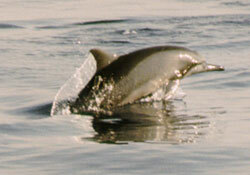 One of the attractions of Bohol is the ability to go dolphin and whale watching on the Bohol Sea. Joselino "Jojo" Baritua runs a project in which former whale-hunters can still use their whale and dolphin spotting skills to earn a living, but now to guide tourists to the best spots for a meeting with those gentle giants and playful jokers of the sea. After being in touch with Jojo for about a year about his dolphin and whale watching operation, we finally had the opportunity to meet him and join him on a small expedition of dolphin watching. We didn't go for whale watching, since we arrived in the wrong time of year. I invited my family-in-law to join the trip, because, although they live in Bohol, they have very little opportunity to see much of the natural beauty of the island. Even though Alona beach is just 50 kilometers from home, their are little opportunities to go there, let alone stay there. We made an appointment to be picked up at Alona beach at six o'clock in the morning: for dolphin watching you've to wake up early, as they forage early in the morning, and their hunting grounds are quite some distance from the coast. course, we've seen an occasional dolphin while on a ferry, and I have seen several dolphins in a dolphin show in the Netherlands, but now we hoped to see them in full freedom and from close by at full sea. After an early breakfast, we walked to the beach, where we found the large banca already waiting for us. We waded a few steps from the beach to the banca, and climbed on board via a small stair connected to the bow. This banca, called Lores, was actually one of the former whale-hunter boats. It was confiscated in Talisay City, Cebu in March 1999 when it was unloading chopped fresh whale shark meat for export to Taiwan. The boat was only released one month later, after paying a P 45,000.00 penalty. Lores joined the dolphin and whale-watching program in January 2000 and since then has no longer been used for hunting whales, dolphins and whale sharks, except by tourists who carry loaded cameras instead of harpoons or guns. After we all were settled on board, we set off. First, the crew pushed the banca away from the beach with long bamboo poles, then they started the engine, and we got some speed. It is actually quite surprising how fast these bancas can go. whale shark and manta rays. twenty minutes - Alona Beach was already far away on the horizon - he told us he could see the splashes of jumping dolphins. But I wasn't able to see anything but waves. It took me another ten minutes before I could first see the dolphins jumping. As we came closer to the spot, we started to see more and more dolphins. Groups of them popped up at the left and right, and more groups showed up at the horizon. The banca slowed down, and we found ourselves literally surrounded by dolphins, some jumping up and giving away a nice show of their acrobatic capabilities - if you ever wonder how they teach all those jumps and twirls in a dolphin show: they don't; dolphins are natural talents. The kind of dolphins we were watching now are aptly called "spinners" as they are capable of spinning around their own axis when they jump out of the water. All this jumping and spinning is of course great fun, but also serves a purpose. The dolphins are actually hunting for fish. One group of dolphins chasing the fish, scaring them with all the noise they make, while others wait. We could see the fish jump out of the water in an attempt to escape their enemies, but only to land straight into the mouths of another dolphin, an interesting spectacle to observe. Taking pictures of dolphins takes some patience and luck. Even when there are plenty, they jump out of the water unexpectedly, and disappear before you can even press the shutter. Most of they time you will end up with only their tails being captured on the film. You will need a good telescopic lens to be able to get some nice close ups. We continued following the dolphins. By now, we saw groups of dolphins appear over a stretch of about two kilometers or more, maybe over 500 of them, a magnificent view, which we all enjoyed. Not far from us was another banca, from one of the dive shops on Alona Beach, carrying a group of tourists also observing the spectacle - but then suddenly a third, smaller banca appeared. At first it was unclear what their business was, but then it became apparent that the people on board were actually trying to kill the dolphins. The crew on our banca looked angry and told us they were Badjau, and started to gesture angrily at the other banca. The skipper, Joseph Valeroso, himself a former hunter who had been behind bars for 5 days fined P 5,000.00 when the Lores was captured in 1999, started to chase them. They quickly went away. Unfortunately, I was not able to take a clear picture of their banca against the low standing sun. This incident again demonstrates that a patrol boat is urgently needed to enforce the ban on hunting dolphins and other protected species in this area. Unfortunately, hardly any funds are available for such a patrol boat, and even if such a boat is donated, funds will be required for its maintenance and continuous operation, which will also cost considerable in wages and fuel. the fish shop on Pamilacan island. spin as his smaller cousin. On Pamilacan, we visit the local fish trader and buy some freshly caught fish, considerably cheaper than in Tagbilaran, and have a look at his collection of ghastly trophies from former days, when whales, dolphins and sharks were still routinely hunted by the Pamilacan fishermen. 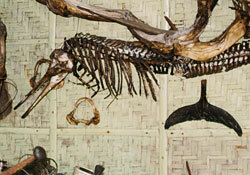 The jaws of numerous sharks, and a complete spinner dolphin skeleton decorate the walls of his shop. We continued our trip to the other side of the island. The cliffs on the north-west of Pamilacan island are now painted with the letters S A N C T U A R Y, and the reef in front of the cliff is now off-limits for all fishing, to serve as a much needed nursery for young fish. The fishing ban here is enforced by the local fishermen themselves, who understand the need of such sanctuaries to be able to maintain reasonable catches at other places, and the fine is a heavy P 1000.
has been for hundreds of years, except that now most bancas are motorized, and that a diesel generator provides electricity from sun-set till about 10 or 11 o'clock. There are no roads, only paths connecting the various houses, and chicken and goats roam around freely. If you wish to stay on Pamilacan Island, you can do so in a small row of simple cottages on the beach. They are without electricity or running water, but just provide a shelter for the night. Including three meals they are P500 per night. A wonderful place to relax for a couple of days and do nothing but watching the beach, the waves, and the contours of the islands of Bohol and Panglao in the distance. If you want to stay here, you'll either have to bring your own food for the first day. Otherwise one day's notice will be required to allow the proprietor to buy the required food. We will not stay here now, but do have an excellent Filipino meal at the place. After our lunch, we go for a swim and some snorkeling along the beach. The reef directly in front of the beach here has been extensively damaged by destructive fishing methods, such as dynamite fishing. Little away from the harbor, the reef is already considerably better, and to the east of the island, the reefs are on of the favorite destinations of the divers, who come here with large bancas from Alona beach. After our snorkeling, we all board the banca again for our trip back to Alona beach, which we reach after about one hour, tired but happy with our inspiring meeting with the dolphins. To organize your own dolphin watching trip, contact Mr. Joselino "Jojo" S. Baritua. His office is at the Public Market, Poblacion, Baclayon, Bohol. 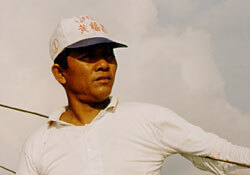 Since he is often at sea, maybe the best way to reach him is by sending an text (SMS) message. The price will depend on the number of persons on board. Best is to go with a group, so that the cost of the boat can be shared. Dolphins can be spotted year-round, but you'll have the best change to spot a whale from March to May. Flights now connect Bohol with Manila daily, so you can now easily fly to Manila, then transfer to the domestic terminal for a connecting flight (1 or 2 hours, depending on aircraft type) to Tagbilaran. Alternatively, you can fly to Cebu (directly from abroad via Singapore, or via Manila), and then use a fast ferry (1.5 hours) to Tagbilaran. You can also take a flight from Cebu to Tagbilaran (half an hour), but given the time it takes to get to the airport, this hardly gains you anything, except some nice sights of Bohol from the air. From Tagbilaran, it is about 25 minutes to Alona Beach, and 15 to Baclayon. It is advisable to stay in the neighborhood of Tagbilaran, Panglao island and Baclayon because you'll have to leave early in the morning, as early as 5:30 o'clock, so that you can see a lot of them during their feeding time. After the tour, you can also stay and enjoy the peaceful island of Pamilacan. Here are the list of resorts and hotels. P.S. We learned Mr. Caraven "Ben" Guirigay recently deceased. We send our condolences to his family. Read all 120 comments by readers. This article has been viewed 2938 times.